Saluda County Council awarded Accommodations Tax Funds at the Mon. Feb. 12, meeting. 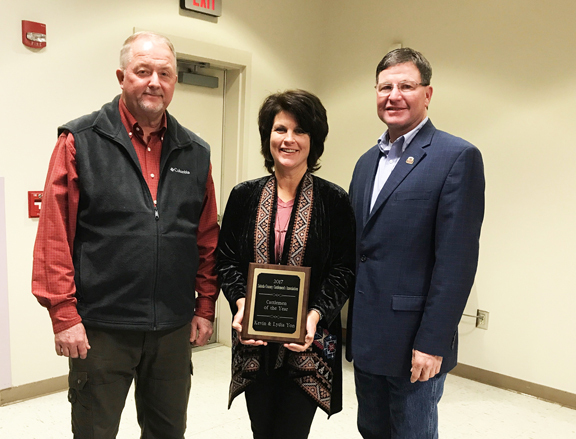 Capital City Lake Murray Country Regional Tourism Board, $1,000.00; Friends of Ridge Spring , $2,000.00; Palmetto Tractor Club , $2,000.00; Richland Creek Antique Power Assoc., $2,000.00; Ridge Spring Harvest Festival, $2,000.00; Saluda County Historical Society, $2,000.00; Saluda County Chamber of Commerce, $1,000.00; Saluda Young Farmer & Agribusiness Assoc., $1,000.00; Town of Ridge Spring/Art Center, $2,000.00. At the beginning of the meeting, a public hearing was held on an ordinance on the execution and delivery of a fee-in-lieu of ad valorem taxes agreement, by bond between Saluda County, South Carolina, And Catalina Solar, LLC. The third reading was passed in the old business portion of the meeting. CEO/Administrator, Keith Paul made a presentation on Saluda Nursing Center. Council approved the a Century Link phone system, at the suggestion of IT Director Mitchell Kneece for the lease term of three years at a monthly cost of $2,804.67, excluding sales tax. Council authorized the Assistant Emergency Management Director Jill Warren to proceed with the Victim of Crime Act (VOCA) Grant application for a desktop computer, a laptop computer, and brochures for the Victims Advocate in the amount of $2,550.00 with the 20% required match of $510.00 to be paid from Contingency. Council approved the purchase a software compatible scanner, at the request of Probate Judge, Brenda Griffith in the amount of $736.00 to be paid from Contingency for Probate Court. At the request Jail Administrator, Janice Ergle, Council approved the purchase of a Hewlett Packard printer in the amount of $533.93 to be paid from Contingency for the Saluda County Detention Center. 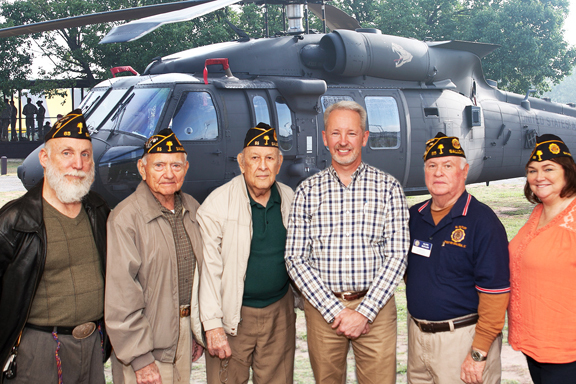 Council appointed William C. Rutland of 420 Hallman Road, Ward to the Saluda County Airport Commission with his first term expiring June 13, 2020. 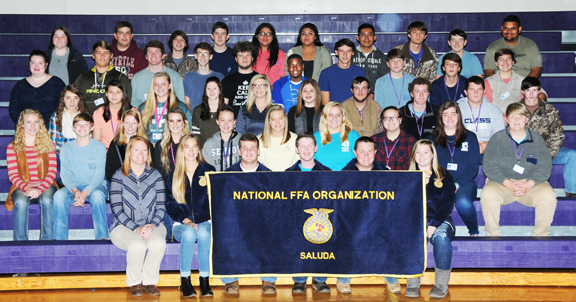 INDIANAPOLIS – The Saluda FFA Chapter in Saluda, SC will celebrate National FFA Week, Feb. 17-24, 2018. This FFA Week embraces more than 90 years of FFA traditions while looking forward to the organization’s future. More than 653,000 members will participate in National FFA Week activities at local, state and national levels. These members have a passion for agriculture. Designated a national week in 1947, the week of George Washington’s birthday, National FFA Week runs from Saturday to Saturday and gives FFA members an opportunity to educate the public about agriculture. During the week, chapters conduct a variety of activities to help others in their school and community learn about FFA and agricultural education. Saluda will celebrate National FFA Week by participating in the following activities: a fun meeting on Monday, Skating Party on Tuesday, visit to the State House for Legislator’s Appreciation Day on Wedesday, volunteering at Christ Central on Thursday, and a Faculty/Staff Appreciation Lunch on Friday along with two of our young men participating in the Mr. FFA Competition at Pendleton High that evening. Today’s FFA members are the innovators and leaders of tomorrow. Through agricultural and hands-on learning, they are preparing for 255 unique career opportunities in the food, fiber and natural resources industry. National FFA Week is sponsored by Tractor Supply Company. 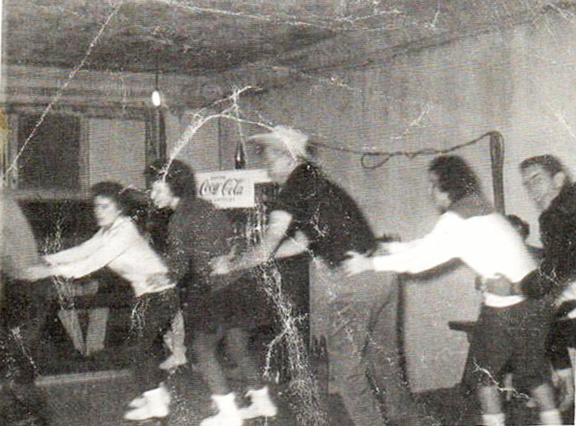 Many people do not know Saluda once had a skating rink. Everette Bledsoe recently came across this photo taken in February 1960 at Bill’s Skating Rink. Pictured, L to R, are Everette (cut-off), Ann Boland, Ann Baird, Hobo Bedenbaugh, Elsie Quattlebaum, and Lenard Smith. Everette soon went into the service after this photo was taken. He and Ann were married in 1963. Sadly, Ann lost her battle with cancer last week. The building where Bill’s was located has been torn down for years. It was where the parking lot is now on West Church Street, next to the old Saluda CPW office. 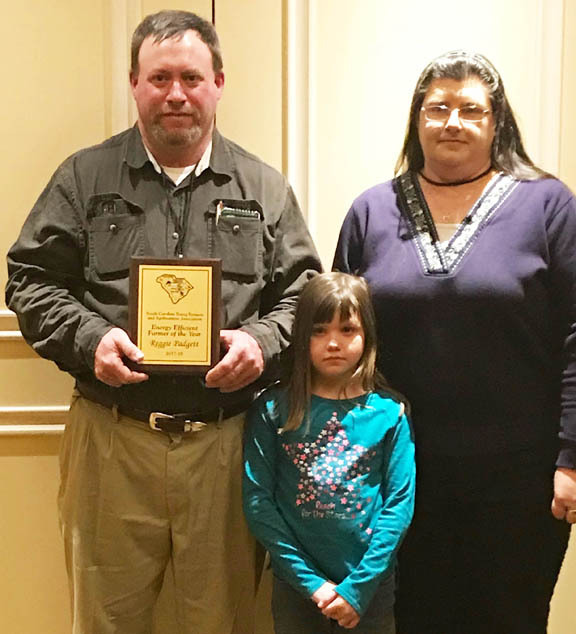 SALUDA COUNTY CATTLEMENS ASSOCIATION 2017 CATTLEMEN OF THE YEAR RECIPIENTS were Kevin and Lydia Yon of Yon Family Farm, Ridge Spring. Pictured with them is Randall Maffett, left. 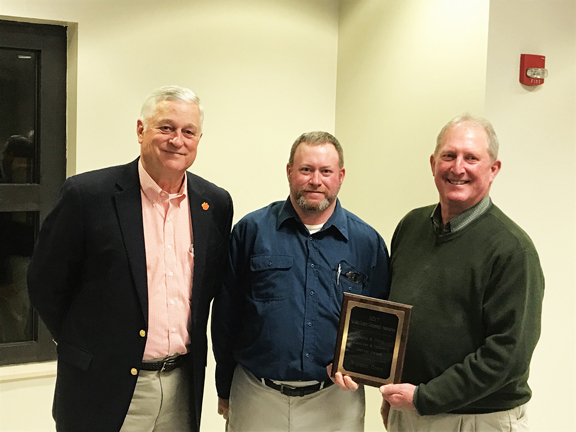 SALUDA COUNTY CATTLEMENS ASSOCIATION 2017 PHILIP R PERRY EDUCATOR AND INDUSTRY AWARD was presented to Watson Dorn of Hickory Hill Farm. 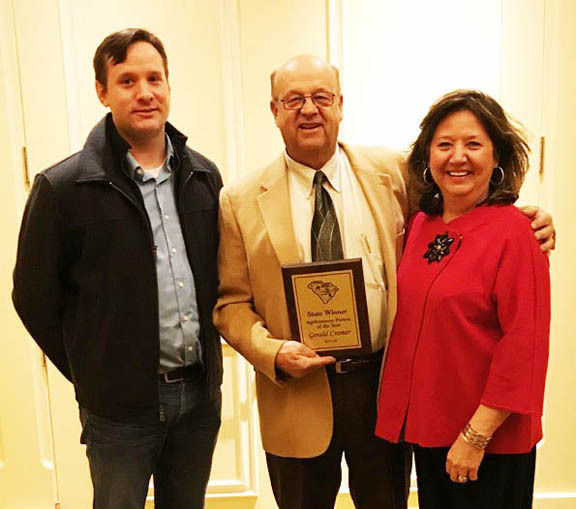 Accepting on his behalf were Reggie Padgett, center, and Joel Black, left. Phil Perry is pictured left. 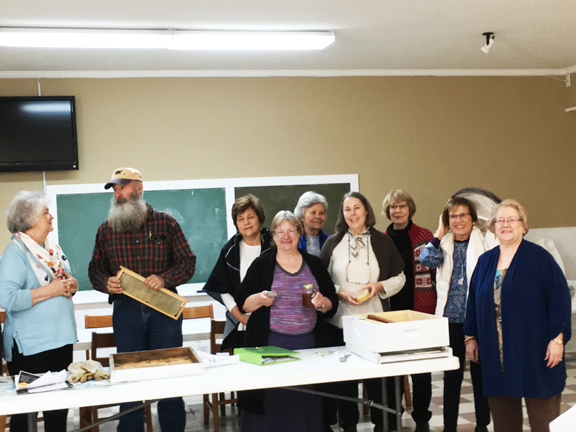 The Garden Club of Saluda met in the social hall at Red Bank Baptist Church on Monday, February 5 to hear invited speaker Bob Shealy’s fascinating talk about bees and his work as a bee keeper. His explanation of the importance of bees in our agricultural South was at the heart of his presentation. Bees play a crucial role in the pollination of crops, making their health and well-being of grave importance to all of us. To begin, Bob explained the amazing structure of the highly organized bee hive and the work of each bee within the hive. The queen, the workers, and the drones have specific tasks to perform, each working for the good of the colony. Bob brought a hive to show and to explain the different parts and how the bees form their honey within the hive. He explained the role of the beekeeper in managing the hive and how the honey is harvested and extracted. He also explained how predators can cause problems and how a hive can be destroyed by other pests. He reiterated what most people already know that the use of pesticides has played a large part in the alarming reduction in the bee population in our country and in many other parts of the world. He said what will kill one insect pest will also kill a bee. One of the things Bob stressed was the bees’ needs for nectar sources. He said with mass clearing of land, the flowers upon which they depend have been reduced. He said that we who love beautiful, weed free lawns do the bees a disservice by eliminating one of their very early spring foods, the dandelions. Apparently these spring bloomers have exactly what the bee needs, both carbohydrates and proteins. This could change our perception of this humble little weed as we think of the winter-weary bee looking for its first nectar in the spring. Bob closed with a question and answer session and finally by thanking our garden club and others for promoting the use of flowers in our beautification efforts. He said bees do so much more than produce the delicious honey which he brought for us to sample. They are truly one of nature’s most highly organized and essential creatures. They are well worth all our efforts to help them thrive.